Emily's 2nd Halloween, and her first one with a slight clue what was going on. 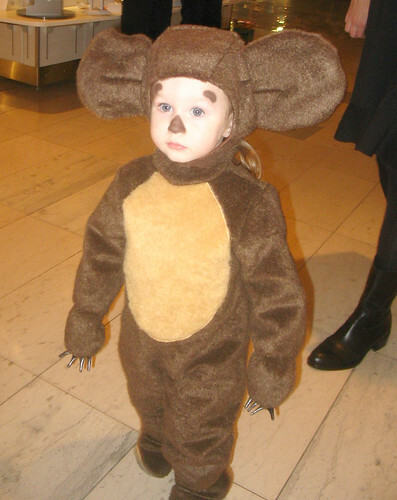 I made her this Cheburashka costume, which has great significance to us but which I knew would be interpreted by most people as a teddy bear (although a few people thought she was a puppy!) I had a serious moment of doubt working on this costume...I didn't think I could pull it off since I was winging most of it. But then everything clicked and it ended up working out fine. Furry felt is pretty awesome, although I feel like washing it would destroy it completely. And I'm not sure how comfortable it actually was -- but she didn't complain a bit, and even kept her hands inside the little paw-mittens! She sure looked cute though! Next year: real door-to-door trick-or-treating! Well, maybe. Best costumes at the mall: two little asian boys dressed as yellow-track-suit Bruce Lee and a Shaolin Monk. Their mom was really happy that Evan recognized both costumes!